Yoga by the Sea, Yoga from the Sky. Sydney is a great city for fitness and outdoor enthusiasts. There are seemingly unending possibilities for people looking to stay active. From surfing to hiking, and everything in between…the city has a lot to offer. I joined a local gym called Virgin Active, which I love. There are a ton of great class offerings, a pool, a sauna and a variety of modern equipment available. The gym has been a great option for when the weather is just too hot to exercise outside…think 108 Fahrenheit/42 Celsius. Sydney is the type of city that urges its inhabitants to get outside. When the sun is shining and the breeze is blowing, it is difficult to opt to stay inside. I’ve walked and jogged along some of Sydney’s well-known ocean-hugging walks including: Bondi to Coogee Costal Walk and Manly to Spit Bridge Costal Walk. I’ve practiced yoga outside, overlooking the ocean and I’ve also found my zen while perched 238 meters in the sky…overlooking Sydney with 360 degree views. Yoga by the Sea offers amazing classes out of Bondi, Tamarama and Bronte Beaches. Classes run seven days a week, but vary by location. It is best to check the online schedule before rocking up to take a class, as they change with the seasons and weather conditions. 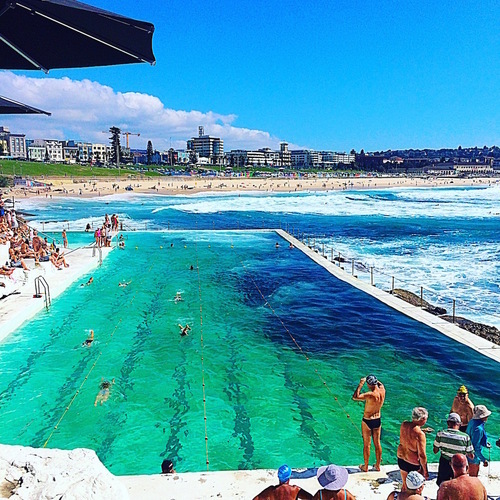 I’ve taken classes at the Bondi location, which holds its sessions at the Bondi Icebergs Club. Stunning views and the aroma of salty ocean water offer up the perfect setting for a transformational experience. I’ve tried both their Yin and Yang-style classes. On hot days, it is especially nice to take a dip in the ocean pool for a relaxing, post-yoga session cool down. Yoga from the Sky starts bright and early at 7:00 a.m. on Wednesday mornings on the observation deck of the Sydney Tower Eye. It is a beautiful way to begin the day, as the sparkling sun rises and shines over the city. A light breakfast of fruit and juice is offered at the end of the hour-long Hatha yoga class. Participants are also given time to snap photos, as they take in the stunning views of the city. I think the experience is well worth the $25 cost. If you are looking for a place to rejuvenate, I highly recommend taking a class at Yoga by the Sea and/or Yoga from the Sky!